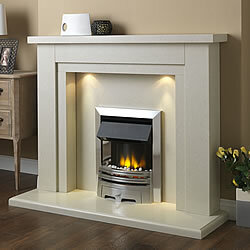 Lumia Augustus LED Electric Fireplace Suite available in two sizes a 48 inchs and a 54 inchs. Comes in Perla Micro Marble finish with Stunning low voltage Downlights as standard.Comes with matching Perla Micro Marble back panel and hearth as standard and shown in the picture opposite. 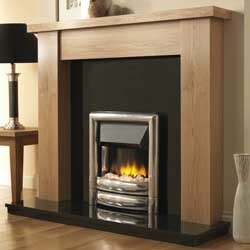 The fire is a Modern 2kW LED Electric fire and there is a large choice of trims and frets to choose from. This Lumia fire comes with a Realistic Coal and Pebble fuel bed effects which is included as standard. Comes with Infrared Remote Control. And is Suitable to be used in homes with no Chimney or Flues.